Maybe I'm turning into an old miserable git at the tender age of 24. I confess after hearing the name, seeing the trailer and even sitting in the cinema waiting for it to begin I genuinely did not want to watch this film. However it wouldn't have been awfully professional of me if I didn't (or perhaps there was nothing else on...), so here I present the 'Neo-Classical, Post-Modern comedy' Hot Tub Time Machine. Set in present day Los Angeles, three friends have had a string of bad luck with their adult lives: Adam (John Cusack) has been dumped by yet another girlfriend and his video game obsessed nephew Jacob (Clark Duke) lives in his basement; Lou (Rob Corddry) is a party guy past his prime; and Nick (Craig Robinson) has a dead end job and a soul-sucking wife named Courtney who controls his every move. In a last ditch effort to recapture the spirit of their youth they decide to check into a run down hotel, get severely drunk and wake up the next morning in 1986 by virtue of...yes...that's right...a Hot Tub Time Machine. Now I love the majority of 80s pop culture; the music, the films, the cartoons, it was all absolutely glorious. However it was a shame there was very little of this present in the film. I concede I found myself laughing out loud in parts but really it was nothing that I wouldn't of laughed at regardless of which decade it was set in. Technological advancements aside, 80s pop culture is too similar to the decade we live in today. The highly ambitious concept resulted in a missed opportunity to do something so naff yet brilliant. I got the impression the producers of the film were drunk one night and wondered what would happen if they cross the grossly over-rated comedy, The Hangover, with Robert Zemeckis' wonderful, time hopping, Back to the Future trilogy. Despite the obscene concept, the performances were actually quite entertaining. Though I always feel like I'm missing something, John Cusack is a good actor right? I'm not just imagining this? Either he likes to swim through the oceans of mediocre films or he's simply got an awful agent. High Fidelity aside he just isn't charismatic enough to carry movies like this. Clark Duke's performance as 'the geek' was probably the most amusing, possibly because out of all of the characters he was the one who was deeply unsettled living in a decade bereft of the Internet, Facebook, Twitter. Almost like a modern Marty McFly. The highlight for me personally was the appearance of screen legend Chevy Chase, playing a character not too dissimilar to that conjured feelings of Time Lords from Doctor Who and Christopher Lloyd's iconic Doc Brown. One tiny criticism is the bland choice of 80s music present, making me wonder if the soundtrack was just a Best Of compilation from the era instead of taking the time to have a bit of fun with some of the choices. 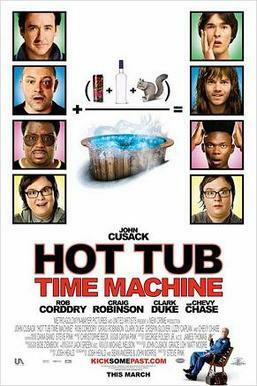 Films like Hot Tub Time Machine are plentiful however many rarely succeed in hitting the mark of comedy excellence. This movie just about gets away with its absurdity. Fun way to kill a couple of hours, and it even makes me smirk a little at the mention of its outlandish title but please, just don't make me watch it again. Hot Tub Time Machine is in cinemas nationwide now.